Dubai: Sales of diamond jewellery continue to outpace gold consumption in the UAE, as prices of the yellow metal scale heights and jewellers capitalise on higher returns of polished gems, industry sources told Gulf News. Diamonds' high growth, however, should not be taken as a sign that jewellery lovers are moving away from gold. Recent consumption patterns only show that the jewellery market is growing and consumers are increasingly looking for gem-studded pieces. "The trend these days is definitely to diamonds in the whole GCC. This trend started in the late '90s, but now it is gaining momentum. At the beginning of the world financial crisis, there was a breakdown in diamond sales but the situation is now back to pre-crisis levels," said Rolf Schneebeli, CEO of Joyalukkas. "At the same time, one must also clarify that there is no move away from gold. The market is growing and the growth is in the diamond segment," Schneebeli told Gulf News. 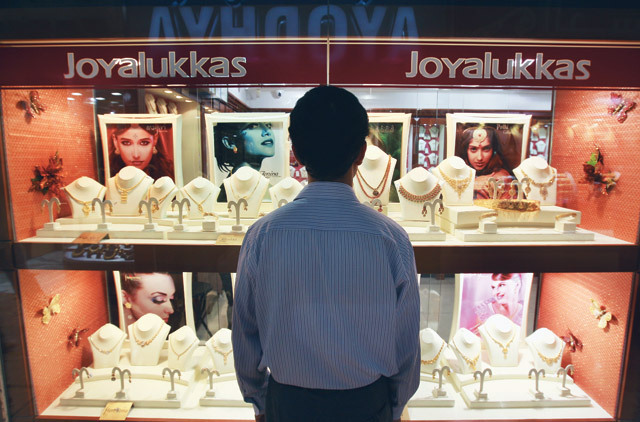 Diamond jewellery sales at Joyalukkas stores in the UAE rocketed by more than 70 per cent this year compared to a year ago, while gold sales stayed flat to "slightly down" by 5 per cent during the same period. At Pure Gold, diamond sales increased by 55 per cent, while gold was at 40 per cent. Schneebeli attributed the trend to high gold prices and the rising number of "luxury" consumers. Retailers have also picked up advertising campaigns to promote diamonds, as plain gold pieces offer limited returns. "Gold and silver are common assets in the regional societies and are rather a daily necessity than luxury. But clients in these maturing economies and the creation of wealth require other materials to differentiate the owner from the neighbours, and diamonds offer exactly this probability through the inherent luxury image," he explained. "Also, the gold price has dramatically increased and diamonds suddenly appear comparatively affordable. In addition, there are a lot of advertising campaigns for diamond jewellery going on and have a good success rate. As margins in plain gold pieces are very small compared to diamond jewellery, campaigns for gold are not that attractive or, at least, less profitable for the jewellers," Schneebeli added. Firoz Merchant, founder and chairman of Pure Gold Group, confirmed in a previous interview that many consumers now prefer diamond jewellery as gold prices continue to soar and people want more value for their money. He, however, noted that consumers will find it easier to re-sell plain gold pieces. "Just walk into a shop and within 15 minutes, you will get money if you sell your gold. It's faster than getting cash from the bank. If you re-sell diamonds, it may take some time. We need to check the colour, carat, clarity or weight of the piece," Merchant told Gulf News. Oofrish Contractor, marketing manager of Liali Jewellery, said the shift towards diamonds started some time ago, since gold prices have increased and banks are offering easy payment plans. After suppressed demand during the height of the financial crisis, spending on gold jewellery has recovered strongly in the UAE, thanks to tourists' money and improved consumer confidence. Overall, global jewellery demand in the first quarter rose 43 per cent to 470.7 tonnes, according to a World Gold Council report. The rise was the result of a very strong recovery in non-western markets, where consumers are encouraged by the anticipation of higher future gold prices. Although the first quarter is not the main wedding season, the strongest performing market during the period was India, where demand soared 291 per cent to 147.5 tonnes. Indians were encouraged to make early wedding-related purchases to take advantage of the relatively low, stable prices that prevailed during the first quarter. Among the other strongest performers were the UAE, which registered 29 per cent growth, Saudi Arabia (25 per cent), Hong Kong (23 per cent) and Vietnam (20 per cent). "Increased tourist numbers in Dubai, particularly from the Indian subcontinent, supported gold demand in the UAE, which rose to 18.9 tonnes in the first quarter from 14.6 tonnes a year earlier," the report added. Improved consumer confidence and greater acceptance of higher gold prices among resident consumers have also contributed to the increase. Which type of jewellery do you prefer? Have you made a diamond purchase recently? Has the uniqueness of owning diamonds been lost?